When you own a gym, you know that building your brand and your local presence is a never ending project. Everything you do locally or online helps your business reach new prospective members. To help, we compiled a list of 10 tricks that you can implement today to make growing your gym or studio easier and provide better results. From Yelp and Google to working with local partners, this list helps you check off different growth strategies and build your presence faster than ever before. If you like what you see, check out our full list of 32 Actionable Ways to Increase Online And Offline Presence at Your Gym or Fitness Business. 1.) We are assuming that your business is already on Google Maps and Yelp. If it isn't, you're in luck! Check out the blogs we wrote which can help: How to get your gym or fitness business on Google Maps. and How to get your gym or fitness business on Yelp. 2.) Collect as much “social proof” as possible. Consider “social proof” the closest you can get to word-of-mouth advertising without it being word-of-mouth advertising. For our purposes, social proof is anything that allows others to read the thoughts of someone that’s already using your services. Said simply: Get as many positive quotes about your business as possible and use those quotes wherever you believe they’d generate the best results. Be strategic about it. We suggest using social proof on your contact, sign up, pricing, and/or schedule pages. Basically, use them anywhere you think someone might need a little extra push. 4.) Almost nothing in marketing is "set it and forget it." Even when it comes to reviews, you can't forget to ask for them and you certainly can't forget to "review the reviews" from time to time. Don’t allow negative reviews to go unanswered! And remember, whatever you say in response will most likely be public and able to be read by current and future members. 5.) Geographic targeting in online ads can be incredibly useful and a great way to avoid wasting money on ads that won't be seen by the right people. With the right geo-targeted ad, you can spend way less money and achieve considerably higher returns. Using your current member or client data, do a search for zip codes and do your best to plot out where most of them live in relation to your location (cool rhyme!) and then transfer that knowledge to an appropriate online ad. Learn about Google’s geographic ads. | Learn about Facebook’s geographic ads. 6.) Apple Maps is growing. You need to ensure your business is on it. Check to make sure. We even wrote a blog about Apple Maps and how to do this. 7.) Remarketing: You’ve spent time and probably some money getting people to your website, but just because they’ve arrived doesn’t mean they’re going to take the desired action. When this happens, you don’t want the last interaction to be when they close their browser window. To prevent this, you can “follow them around the internet” with relevant, non-intrusive ads. It seems weird and a little creepy, but it can work. A service called AdRoll can help. Our suggestion is to start small and use remarketing strategically. Not every page on your website needs to trigger a remarketing cookie in the visitor’s browser. However, if they land on your homepage and then navigate to your services or membership page they will be a much better candidate to receive remarketing ads as they’ve shown an intent to buy. Remarketing ads aren’t annoying to the viewer if you target the correct audience. 8.) Partner locally. Look for businesses that align with yours, or are compliments to what you offer. Juice bars, health food stores, etc. But don’t neglect the places where people may be looking for inspiration or life changes! 9.) Don’t spend all this time and effort promoting your business just to let after-hours calls go to voicemail. Use a service like GymPhone to prevent this. A lead is a lead even if it comes in at 3am. 10.) Use Google’s “Sitelink Extensions” which are links that show up in Google search results that give your listing way more screen real estate and allows people to click right to what they’re after without having to first go through your homepage. Find out more about sitelinks here. 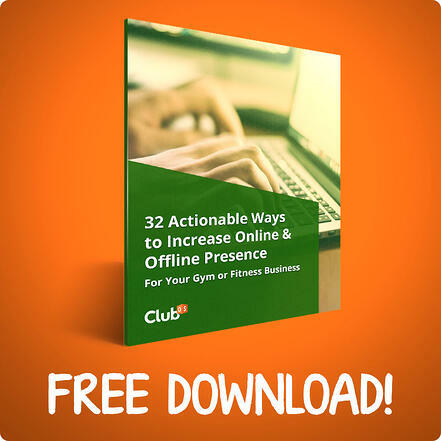 To see the rest of our online and offline growth resources, download our checklist "32 Actionable Ways to Increase Online And Offline Presence at Your Gym or Fitness Business."